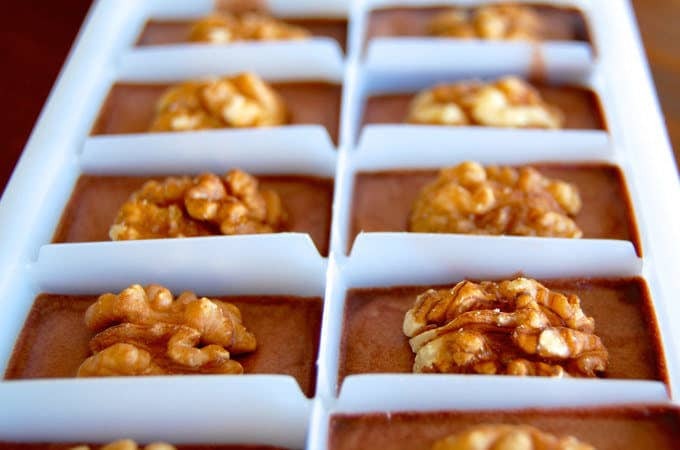 Chocolate fat bombs are the perfect way to keep sugar and carb cravings away. They have a wonderful rich taste full of coconut oil, cocoa and tahini, to give a smooth texture. Are you over your fear of fat? If you are hungry do you reach for carbs, protein or a healthy fat? 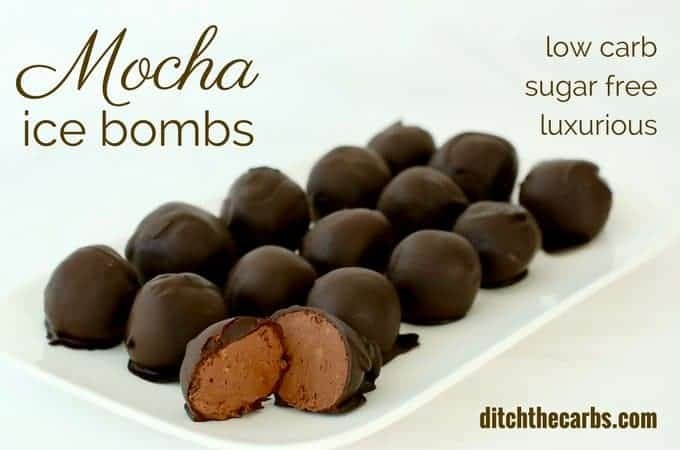 Fat bombs are the secret to keeping hunger at bay. Remember these 2 vital points – before you increase your healthy fat intake you MUST lower your carbs otherwise you are back on the standard American diet (SAD) which is high fat and high carbs AND the fat you eat must be a healthy fat, coconut oil, butter, extra virgin olive oil, etc. 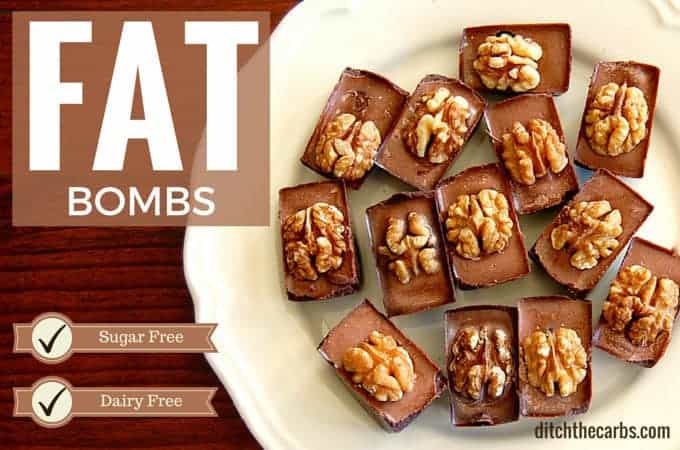 Fat bombs are kept in the fridge until you want to eat them, otherwise the coconut oil will melt or soften. 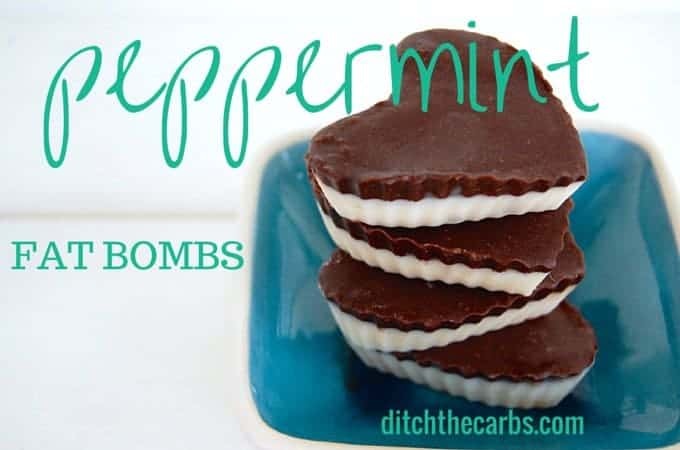 You can make them as a dessert or just to keep when hunger strikes. Chocolate fat bombs help you at the beginning when you really have some serious sweet carb cravings. 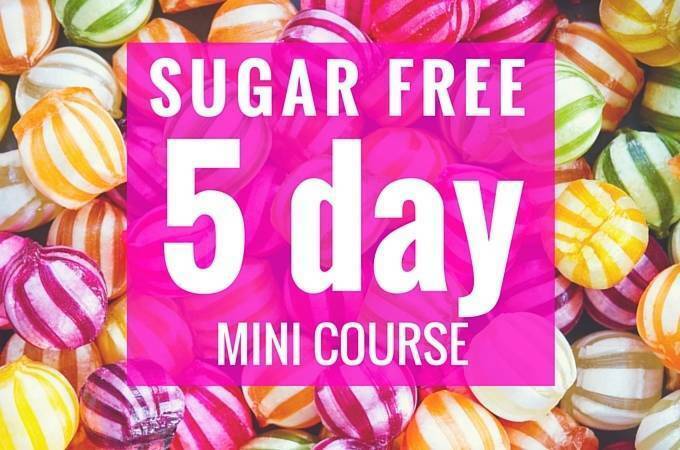 These will help stop you reaching for the high sugar candy and keep you fuller for longer. Warm the coconut oil until melted. 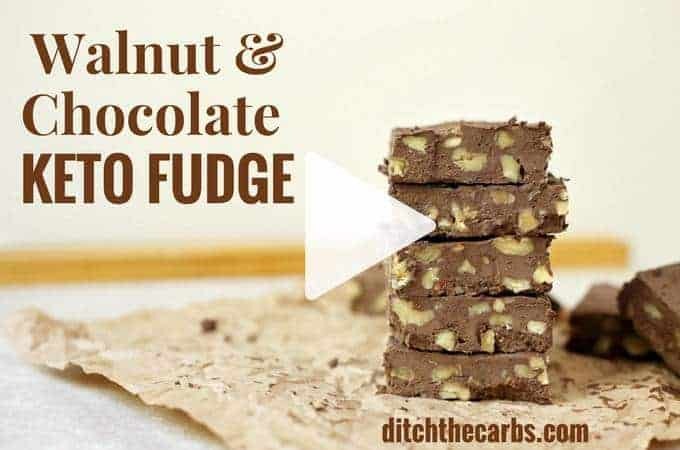 Add all the other ingredients (except the walnuts) and allow to cool slightly so the ingredients don't settle and sink to the bottom of the fat bomb..
Pour into ice cube trays and refrigerate until semi set. Once almost set, place a half walnut on top of each fat bomb. The taste of fat bombs is incredibly personal. How sweet you like them depends on how your sweet tooth has adapted, and if you are a dark chocolate or dairy milk chocolate lover. The carbs in the fat bomb come from the walnut so you can delete these if you want to. If you love my chocolate fat bombs, why not try these. whoah this blolg is magnificent i like reading your articles. Keeep up the great work! You understand, many persons are searching around for thyis information, you can aid them greatly. When I’ve made fat bombs I’ll eat 3 or 4 as they are so yummy, so for me they don’t work ☹️☹️ any ideas to get around this problem Libby? Nibble them slowly and remind yourself that you eat only when truly hungry. Part of changing the way we eat and think about food is understanding when to stop. I know from experience this is such a hard lesson, but a valuable one. SO many people overeat because they love the taste, not because they’re actually hungry. So why not freeze them then set yourself a limit of 1 and enjoy it as slowly as you can. can I use almond butter in place of tahini. and would it affect my carbs etc. new to this and trying to find a recipe I can just put into my app. Sure thing! That would be lovely. Tahini = 1.8g net carbs per tbsp Almond butter = 1.4g net carbs per tbsp. Hi! Any suggestion to make these a little harder? Mine melted so quickly on room temp. Thanks! You can freeze them too. That will make them last longer at room temperature, especially of it is a warm summer. You may call it essence or extract. It is the concentrated flavour you add, such as vanilla, peppermint, almond etc essence/extract. What size are your ice cube trays? Trying to find some on amazon but not having luck with the standard size. Any size you like will work, these are the ice cube trays that are similar to the ones in the photos (not the video). I made these this evening and for some reason they will not set. I’ve been cooking the mixture in the fridge for over half an hour and it’s just gritty mix at the bottom and liquidy mix towards the top. What could I have done wrong? I made these and added 2 tbls of double cream. You do need to whisk or stir hard for a while to disobey the sweetener. Heehee, disobey the sweetener. Sounds like fun! Some brands of sweetener are more grainy and tough to dissolve than others. I think I added a tip in the recipe somewhere that to ensure the sweetener dissolves, you can grind it finely (with a coffee grinder or mortar and pestle) or buy the powdered version. The coconut oil should set within minutes in the fridge. Maybe check your ingredients to make sure they are in date and it was actually coconut oil you picked up. Not setting sounds very odd indeed. Mine is set at room temperature in the winter and rock solid in the fridge. I made these today used Natvia and it refused to melt so they are very crunchy, will have to investigate what else I can use. 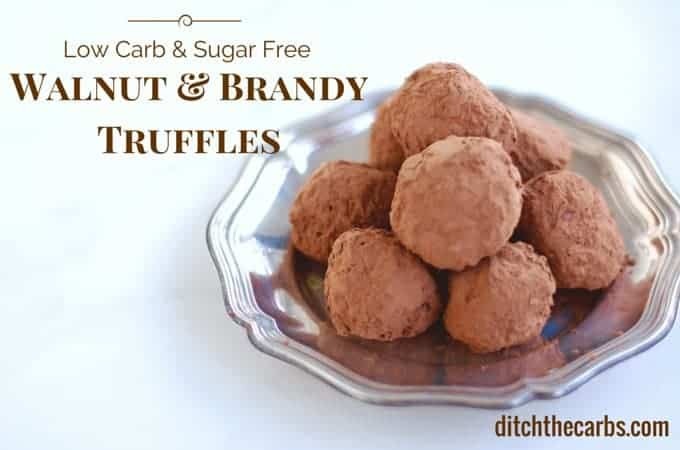 I saw way back in the comments that Erythritol melts easily so will have to try that next time. Is there anything I can do to make the existing bombs a little less crunchy ? Thanks for your wonderful recipes love browsing your website. 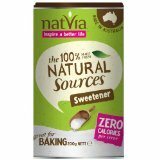 Natvia is stevia and erythritol. I tend to let the melted coconut oil and Natvia firm up a little so it’s easier to mix them together and not sink to the bottom. Alternatively you can use their confectioners mix (similar to icing sugar) or grind the baking mix yourself to be a finer grade. Can you use liquid Stevia in place of the granular variant? Would it still set? Sure, as long as the liquid stevia is concentrated and you don’t have to use to much volume. I would add the stevia to the tahini first before adding to the coconut oil otherwise it might split the mixture. Have just started trying out your recipes and this was my first, I had problems getting the sweetness right because I was using a strong powder type of stevia that I had so I thought I would need less than what you stated in the recipe. Turned out I was wrong, so I bought the same Natvia sweetner that you use and they came out tasting great! The family did find them a bit grainy at the bottom though and I wondered if that might be the sweetener since the Natvia is granules rather than fine powder. Are you supposed to heat the coconut oil enough to actually dissolve the sweetener completely? I mixed it all through but it didn’t look like the sweetener was dissolving so I thought maybe it was supposed to be like that? I try to grind those granules up a little before I add them as it can be really tricky to get them to dissolve. You can buy the icing ‘sugar’ that Natvia makes but it is more expensive. I can’t have chocolate. I don’t like pumpkin or coconut. Have a recipe for me? Search Libby’s site. She has many many recipes! You’re sure to find several that will meet your needs. Libby , love your recipes , have been struggling for a while, but your site has got me on track beautifully. I live in a very hot climate , my coconut oil does not stay solid difficult to weigh, so have been using the same quality in mls is this correct ? do you think i could replace the sweetener with a date? You could but be aware it would no longer be sugar free. Take a look at my ultimate guide to sweeteners. I was apprehensive about these, thought I would hate them. Boy was I wrong! These are amazing! Just the sweet treat I need now and again. I used natures way super greens + cacao, which I like to use instead of regular cacao because the stevia already combined in the mix has no bitterness and is just the right sweetness for me. And I omitted the walnuts because I didn’t feel like them. I’ve been on this diet for a week, and am lactose intolerant & have high insulin. Any suggestions for how to do this WITHOUT loosing weight? Thanks again – finding you was truly a blessing! Thank you for your kind comment. Im glad you have found my website helpful. As for not loosing weight, you can add more protein and more fat. Generally when people want to lose weight I say to cut back on the fat, but you want to maintain so you could have more. Have some more protein but keep an eye on what it does to your blood glucose levels as it can raise it and cause an insulin demand. More nuts too would keep your weight stable and hunger away, but again, not to excess as the carbs soon add up. 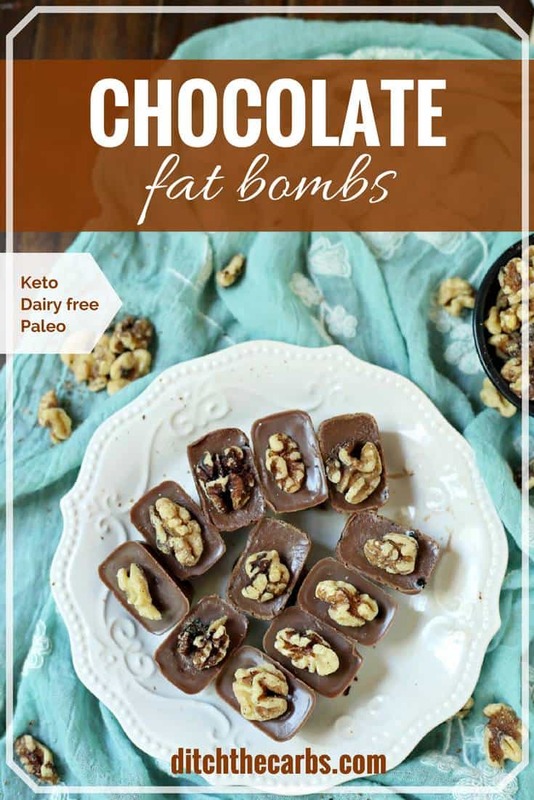 Try the fat bombs, the might be an idea for you. I thought that if you want to lose weight, you cut back on the protein and maintain or increase the fat due to the way they both metabolize in our bodies. Can you clarify? Thanks for a great website! To lose weight most people maintain their protein which should be moderate not high (we don’t want muscle loss) and cut back on the dietary fat so the body utilises fat from our own body stores, not from the food we eat. I totally missed the tahini paste while making these, but it tasted delicious! I can’t wait to make these again. I’m craving this so much. Some of the chocolate got sticky and thick. But when I ate it, OMG! It was better than the others. I’m going to try to make all of it thicker next time! Lol! Can I skip the tahini paste? Inspired by this recipe, I made a version omitting the tahini (purely because I didn’t have any) and with a little sugarfree strawberry jelly powder instead of sweetener. I topped each one with an almond. Delicious! Next time I am going to experiment with adding in a nut butter. No need to be rude to those who ask for U.S. measurements. If it provided both then everyone could follow the recipe. These look great and I will have to try. Weight is the most accurate way to get consistent results. Most scales have the ability to switch to grams. Enjoy. Yay, sending you a virtual hug. You wouldn’t believe how many comments I get regarding weight and oz and cups. I cannot wait for the US to go metric. Will it ever happen? Using an electric scale has to be the easiest way to cook. Just tare to zero in between each ingredient, you don’t have to get any measuring cups dirty. So simple for either metric or imperial. I’m in the US and I actually prefer weight because I make recipes by weight using my food scale, and rarely use measuring cups. Calorie tracking is just more accurate that way. I was wondering, how long does a jar of coconut butter last. I found a jar lurking in the back of the cupboard, & can’t remember how long ago I bought it. I live in the middle of nowhere, so I can’t just ” pop ” to the store to buy one. I’m type 2 diabetic, & am SO grateful for sites like these . I love reading the comments, keep them coming. Yes they can be frozen, and once made should last a week or 2 in the fridge. Where can you get tahini paste, and is it necessary to the recipe? Tahini paste will usually be near the peanut butters or in the health aisle. No you don’t really need it, but I find it gives a nice depth to the flavour. How about a drop of peppermint essence instead? Libby, please just continue what you are doing, your recipes are amazing – the Americans will be able to figure it out if they try hard enough 🙂 no need to make extra work for yourself, your website is already super helpful, thank you ! These are BEAUTIFUL! I just need to get rid of some of these (stupid) food intolerances so I can make your recipes. (Dairy and nuts, I’m looking at you!) Anyhow, I will–and I will be making some of your recipes. Being lazy, I think I, too, would like the cups and tablespoons. I know that’s so much harder for you! I think that very conscientious people weigh here, but moms with young kids don’t have time to. It probably is best to weigh, but we’re Americans. Just give a smile, and close is good enough. 🙂 Love the ice cube tray tip! I love it “give a smile, and close is good enough” – that is exactly how I cook, but I have had to weigh everything for the website. I am a “throw what you have in the dish” kind of cook and make it up as I go (which I guess is why I develop so many recipes) but I would get complaints about a handful of this and a squidge of that. I only weigh because cups are so inaccurate (how do you get a cup of coconut oil or nut butter out easily) so I put my bowl on the electric scales and just keep on pressing tare so the balance starts at zero between each addition – easy peasy. How many did your recipe yield ? I make a batch with: 150g coconut butter, 150g Unsalted butter, 150g macadamia butter (or almond) and 100g 90% Lindt. Pour into a SILICONE icecube tray (easy to push out) for bite sized treats. Popular with the whole family – especially the students! Hi Vered, any idea of the carb count? What about the carbs in cocoa powder? That’s where the carbs come from, and the walnut. Heather, there are 0 carbs as there is no sugar added. The calorie count in one ‘bite’ is about 85 to 125. Could you suggest a tasty healthy alternative to the coconut oil it makes us want to vomit. thank you. It would be really helpful if you gave both metric & US measurements for the ingredients! i second that! cups n tblspns pls along with the metric. thank u! I love this recipe and I am glad you are using coconut oil…it is so good for your health. 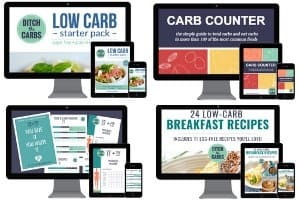 As for the people who want you to convert the amounts…are they lazy…just do it guys…google conversion chart …If you want butter and other fatty ingredients then look up another recipe…leave this one alone…Thanks Libby for the great recipes. Much appreciated.